Nothing is worse than seeing a wildfire spread closer to your property. You feel helpless and scared—afraid you’ll lose everything—including your home and possibly your life. When you design your property into a firewise landscape that includes an irrigation system, your chances of enduring of the wildfire increase unquestionably. In this article, you’ll learn more about firewise landscaping and how a sprinkler system will protect your property during wildfire season. Zone 1: The defensible space where an irrigation system plays a critical role in keeping plant materials and mulch consistently moist. This area is 30’ around your home. Zone 2: This is area is 30’- 60’ away from your home. It’s recommended that you replace any flammable plant material, such as pines and cedars, and replace them with native plants and vegetation. Zone 3: This is the transition zone, 60’- 100’ from your home. If there is a lot of brush and out of control vegetation, it’s wise to clean that area up to reduce feeding any wildfires. 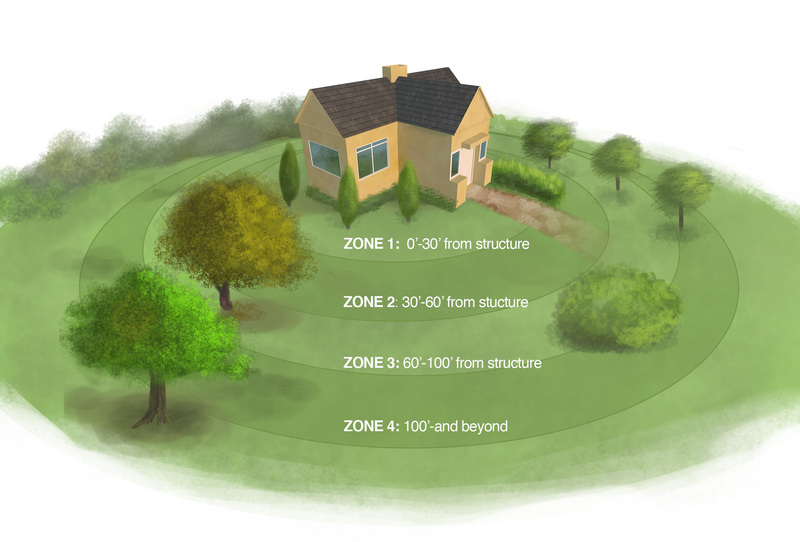 Zone 4: This is the perimeter zone—from 100’ and up leading away from your home. If you live in a developed community, you probably don’t have much control over that area. But you can check with your local municipality or HOA to make sure they’re incorporating firewise landscaping. Your irrigation system plays a important role in keeping your property and life safe by keeping that area well-irrigated throughout the year—and especially during wildfire season. Mulch keeps moisture in the ground. However, mulch is a flammable product, so your sprinkler system should include a dripline or a nozzle directed at your mulched areas. You should water your yard grass and landscapes early in the morning, between 4 – 7 a.m. Modern sprinkler systems come with timers for you to set to start during that three-hour window. Also, irrigation systems have built-in sensors that stop them when the ground is wet enough or turns it off in the event of rain. You can even invest in a smart sprinkler system that you control with your mobile device. You can also invest in a drip irrigation system, also called a dripline system that delivers water directly to your plants’ root systems. It’s perfect for flowerbeds, shrub beds, landscaped trees, mulched areas, planters and container gardens. Dripline systems use 50% less water than using a garden hose or other watering method. Water slowly releases into the soil down to the root system where it’s used the most. When water pressure drops below 25 PSI, the in-line emitter check valves prevent soil or sentiment from entering the dripline. At K-Rain, we are one of the world’s leading manufacturers of gear-driven rotors, sprays, controllers and valves for the residential sprinkler system market. We’re an active EPA WaterSense Partner. We’ve dedicated the past 10 years to designing high performing, water efficient and economical irrigation products that conserve water. When you hire a landscaping or irrigation contractor to install K-Rain lawn sprinklers, you know you’re getting high-quality, water-saving products. Not only do we help you conserve water, but we help you save money with lower water bills too. If you need nozzles, rotors or a dripline system to make your landscape firewise, fill out our Contractor Referral Form today. You can also call us at 800-735-7246 (EST), Monday through Friday, 8 a.m. to 5 p.m.